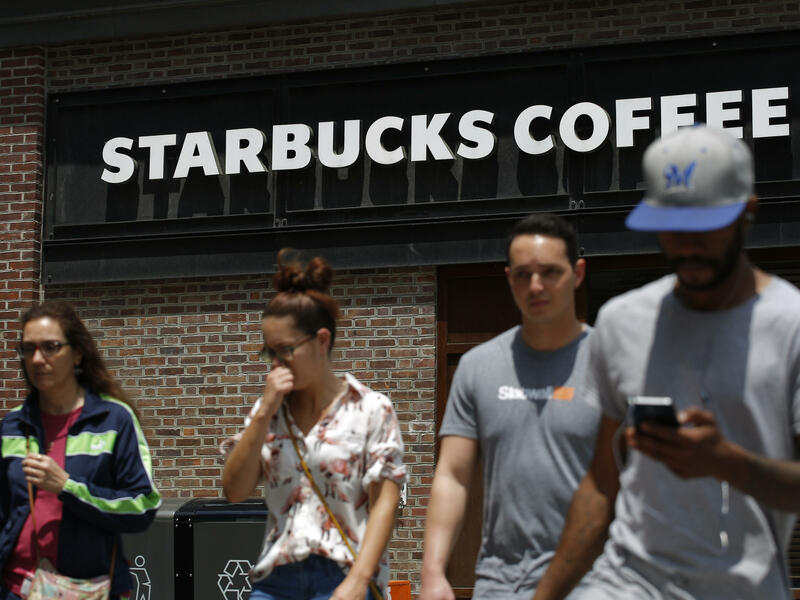 Pedestrians walk outside the closed Spruce St. Starbucks store on May 29, 2018 in Philadelphia, Pennsylvania. Melissa DePino didn't take the infamous April video that showed two black men being handcuffed and ejected from a Philadelphia Starbucks—but she agreed to post it. "I know these things happen," the writer says, "but I'd never actually witnessed it myself. And when I saw it I thought 'people need to see this.'" So she uploaded and pressed "send." It got millions of views, and people are still talking about it. Michelle Saahene was in the same Starbucks at the same time, and had been for a while. She, too, witnessed the arrest and thought something was janky. She'd heard the manager tell the police she'd called them because the two men hadn't bought anything, a violation of company policy. One man had been refused the restroom code; the manager told him "restrooms are reserved for customers." But there was a double standard, Saahene says. "There was a gentleman sitting next to me, a white man, for 45 minutes without buying anything. I saw a white woman come in—mid-jog—use the bathroom, and leave." Nary a macchiato or muffin had been purchased. The Starbucks video soon had company. In the past few months, several white people have been recorded calling police on black people who are going about their legitimate business in myriad ways: mowing the lawn, using the pool, sleeping in the dorm common room. "You have an alarming tendency of white people starting to use 911 as their kind of customer service line when they have any friction with a black person," notes Professor Jody Armour, who teaches at the University of Southern California's Gould School of Law. Many of his classes and lectures are about how race is used—and misused—by the criminal justice system. "You can look at what's going on now as just an expression of the age-old black tax," Armour continues. "The black tax is the price black people pay because of stereotypes and prejudice in America in their official interactions with police and in their everyday actions of ordinary citizens." Robin Diangelo agrees that white supervision of the black presence is a very American thing. Diangelo has been working in the field of race and social justice issues for years. Her newest book is White Fragility: Why It's So Hard For White People To Talk About Racism. Many, maybe even most white people, Diangelo says, tend to second-guess black people when they complain about racism. "We have always policed the bodies of people of color, and black people in particular," she asserts. "The Jim Crow South is a classic example. White flight in the North. School segregation. Gerrymandering..." It's a sad menu of injustices. To that we can add cutting the lawn, selling bottled water on a hot day and visiting the neighborhood pool. And let's not forget the state legislator who got an al fresco visit by the local deputy sheriff because a white woman made a call to report a suspicious woman walking around the neighborhood. Rep. Janelle Bynum was indeed walking around—making constituent visits. She is running for reelection in her Oregon district. Bynum's police encounter was polite and efficient. She even took a selfie with the sheriff and posted it on Facebook. But, she told MSNBC, she was acutely aware that as a black person—even a state official—she knows black encounters with the police can go left quickly, and she wanted to make sure she got home to her family. In the end, it all got sorted out, and the woman who called authorities called Bynum and apologized. But Melissa DePino says her fellow white people need to understand something crucial: "calling the police on a person of color for just going about their life is extremely dangerous, given how our police and criminal justice systems work." USC's Jody Armour agrees: "They are bringing in the police knowing the dreadful procession of hashtags that we've seen in the past three or four years, that any time police enter a situation and a black person is involved, there is jeopardy for that black person." But he says, these viral videos of 911 calls are bringing some change. "Thanks to social media, there's no longer as much impunity-free discrimination that people can express toward others." The criticism that has followed these viral videos has resulted in loss of jobs, resignations, and ridicule. Michelle Saahene says she realized there was work to be done when she was talking to a group of young white women who had been in Starbucks with her during the arrest. They were marveling at how calm the two men were. "I would have flipped out!" one exclaimed. "I guess it was my opportunity to have a mini race relations education with them," Saahene chuckled. "I said you would have been able to flip out because you're white! They looked at me and they were like 'you know what, you are absolutely right.'" She and Melissa DePino started talking and eventually they founded a group, From Privilege to Progress, that helps white people who want to be allies to people of color explore the best ways of doing that. Jody Armour approves. "White allies can start by taking advantage of their white privilege," he says, "to make statements that blacks can't make, to be in places where blacks often aren't." Is it comfortable to do that? Not always. But, says writer Robin Diangelo, there are two stark choices she and other white people have in an increasingly polarized environment: "These things cannot happen without our silence." If white people don't speak up when racist behaviors towards blacks and other people of color are manifested, she says, "our silence is complicity."